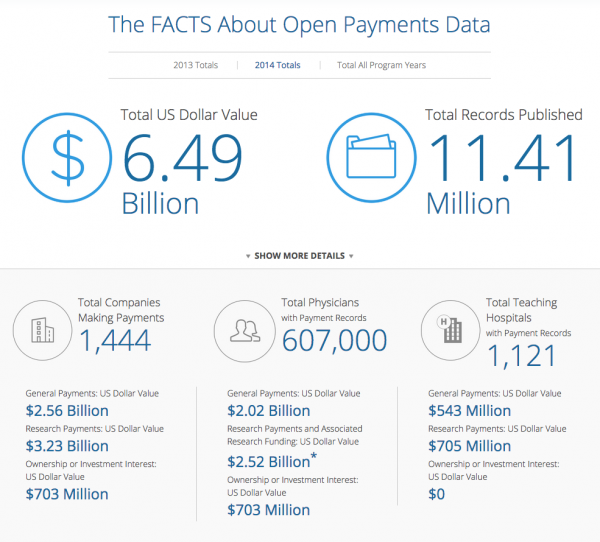 Open Payments & Sunshine Act (same thing-the government’s design to confuse the very people it’s meant to protect) exposes how much Pharma/Device companies paid to physicians and teaching institutions. 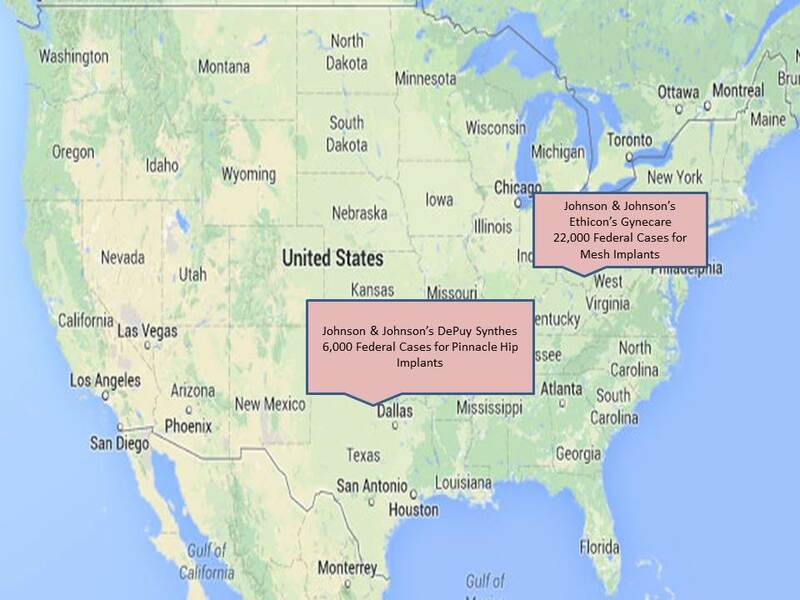 Johnson & Johnson’s (JNJ) Ethicon’s Gynecare for transvaginal mesh (over 24,000 cases pending in federal court (updated from September* map below) which does not account for additional individual cases against the company). 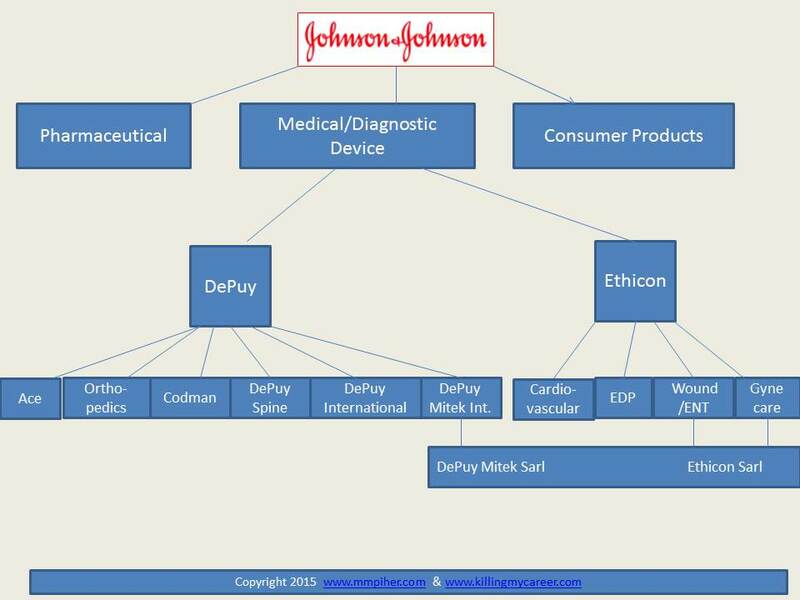 Johnson & Johnson’s (JNJ) DePuy Synthes for ASR hips ($2.5 billion DOJ fine to absolve 8,000 cases in federal court) and Pinnacle hips (6,000 cases currently still in federal court). These locations indicate where the federal mass tort (consolidated) cases are held. Grab a snack-this is going to be a long one. 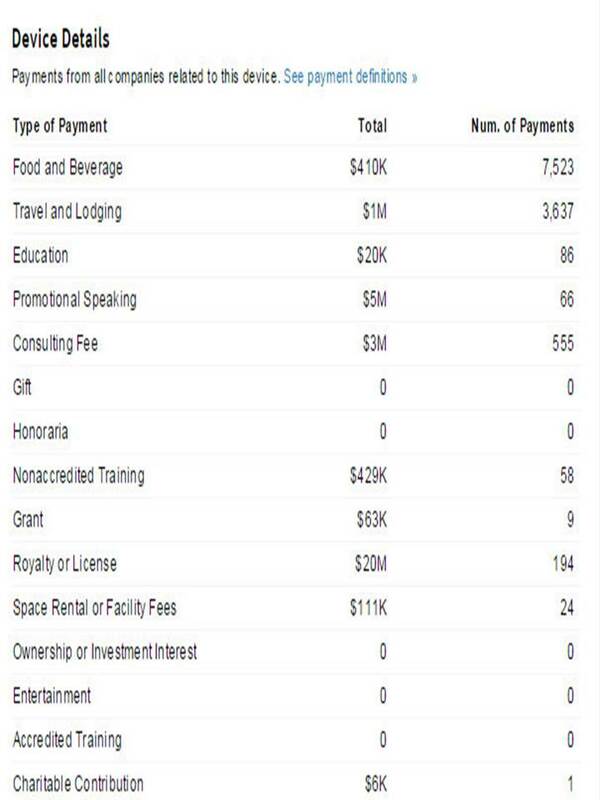 Where is that $2.5 billion the government collected going specifically? 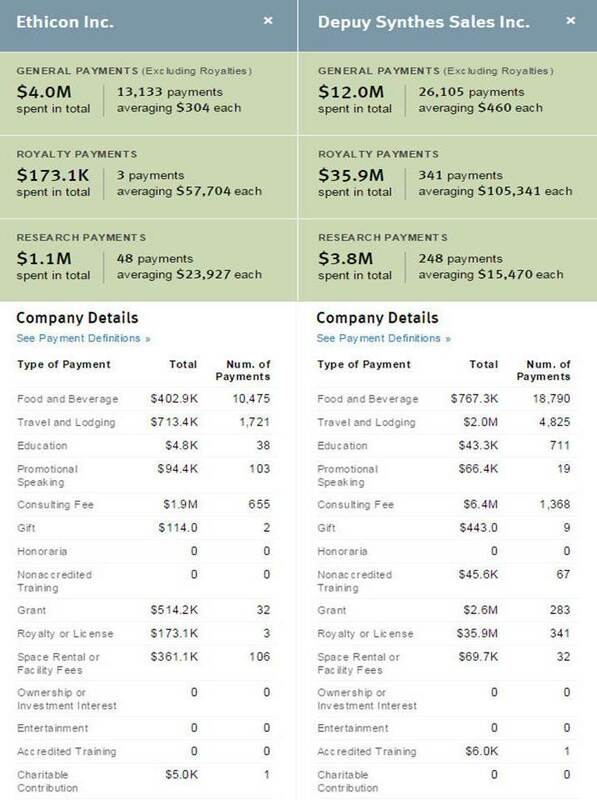 Johnson & Johnson long knew they were going to pay that fine and still managed to spend over $51 million (some would argue) to buy physicians. This money should be going to the victims. Not just from the company but from the government as well. Here’s where it gets tricky, especially for those wanting to track Ethicon. Ethicon, Inc. today announced the launch of a new brand strategy that will unify the brands of Ethicon, Inc. and Ethicon Endo-Surgery, Inc. – two companies with long histories of medical innovation – to create the most comprehensive and global surgical care organization in the world. The new Ethicon strategy is designed to better serve customer and patient needs by enhancing the company’s solid foundation established over the last 80 years, with a strengthened focus on delivering innovations that matter to customers—and ultimately make a difference for patients. The unified brand focus represents Ethicon’s commitment to enabling a simpler, more productive experience for customers by offering one comprehensive Ethicon portfolio for their surgical needs, delivered with a more streamlined approach. The new name was originally thought to be Ethicon One but even the press release is vague as to what the new name is which is again inconsistent & contradictory when it comes to marketing a company with an extensive and established portfolio. Many companies fall under the Ethicon umbrella or subdivisions including Gynecare (mesh) and Acclarent to name a very specific few. 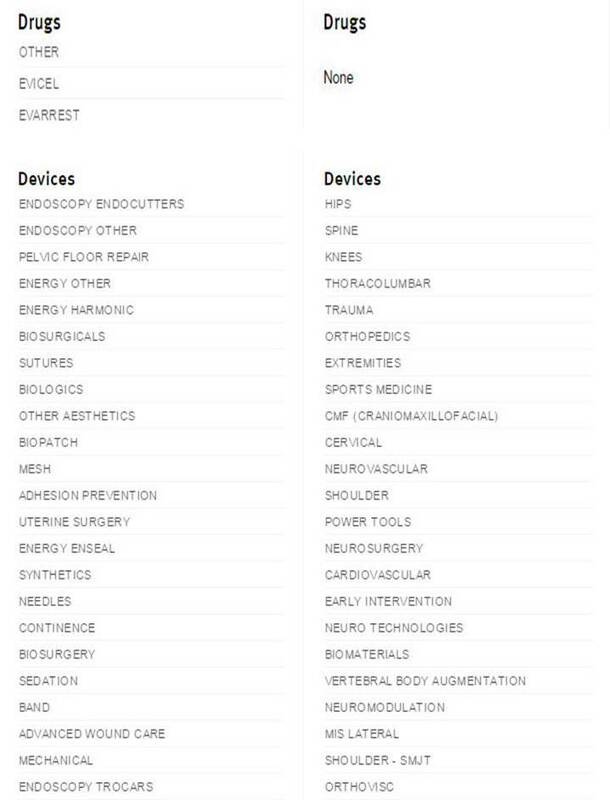 Except under the Ethicon ENT page Acclarent is missing. Really? 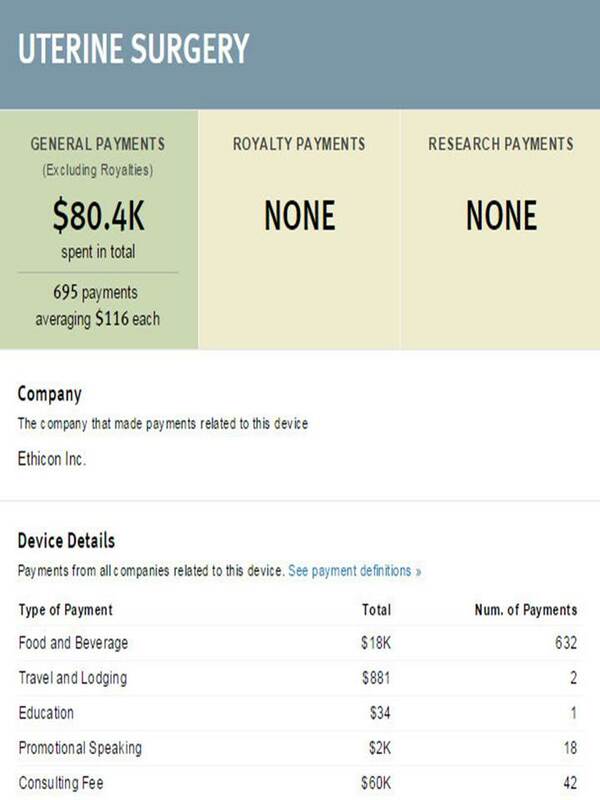 Johnson & Johnson’s Ethicon purchased Acclarent in January 2010 for $785 million and no mention of it on the new Ethicon site? Why is that important? Well, the lack of transparency makes it difficult to track the data accurately. CMS should also require each company break down per division (so not just Ethicon) but each subdivision because unless you’re in the industry and know where to look it’s tough to find. And even if you’re in the industry it’s still tough to find. When looking at specific procedures to try and understand the data again it’s vague and leaves a lot open to interpretation. Transparency is really only transparent when the data is clear and user friendly-the CMS has made improvements but still has a long way to go. Thankfully ProPublica helps more so than CMS; but, the average person shouldn’t have to visit several sites to access the data. Data is only useful when you know what you’re looking, can find it quickly and know how to find and apply it properly. This is not the case with the CMS data-yet. 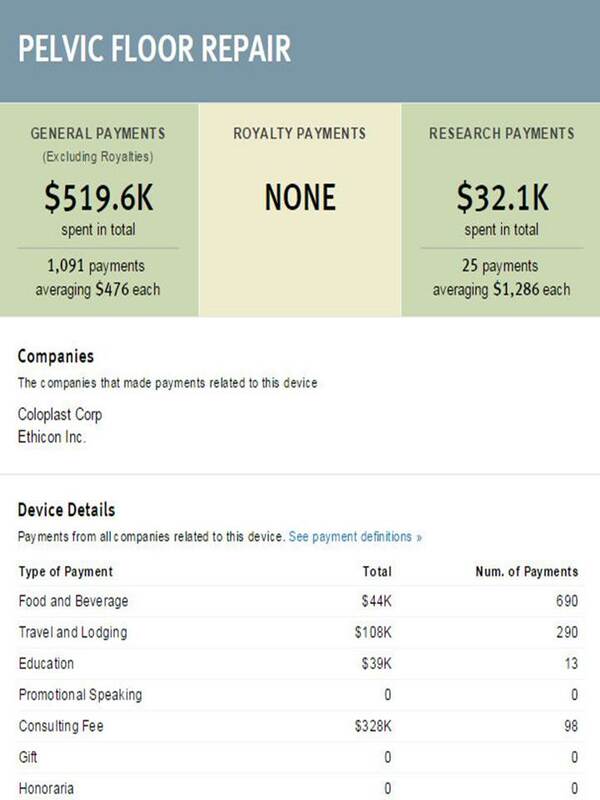 This shows just Coloplast (does that sound familiar mesh victims?) 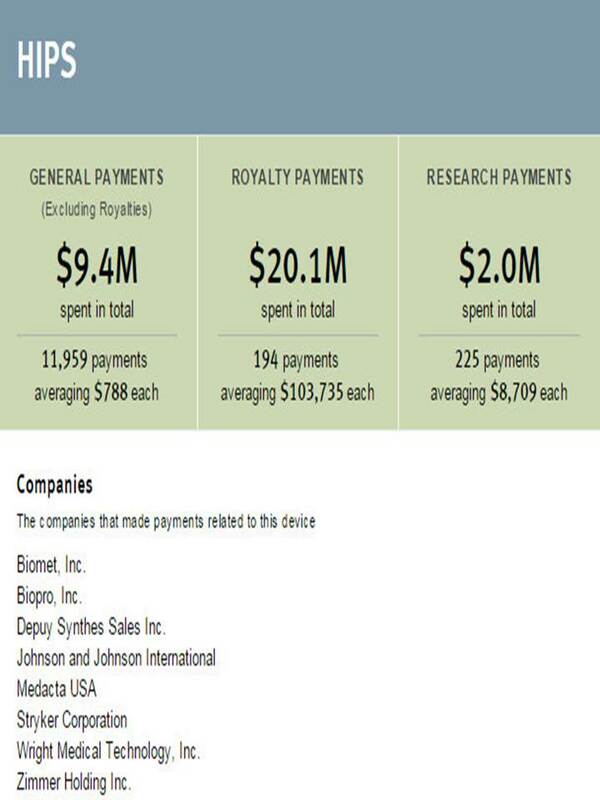 and Ethicon made payments under Pelvic Floor Repair. 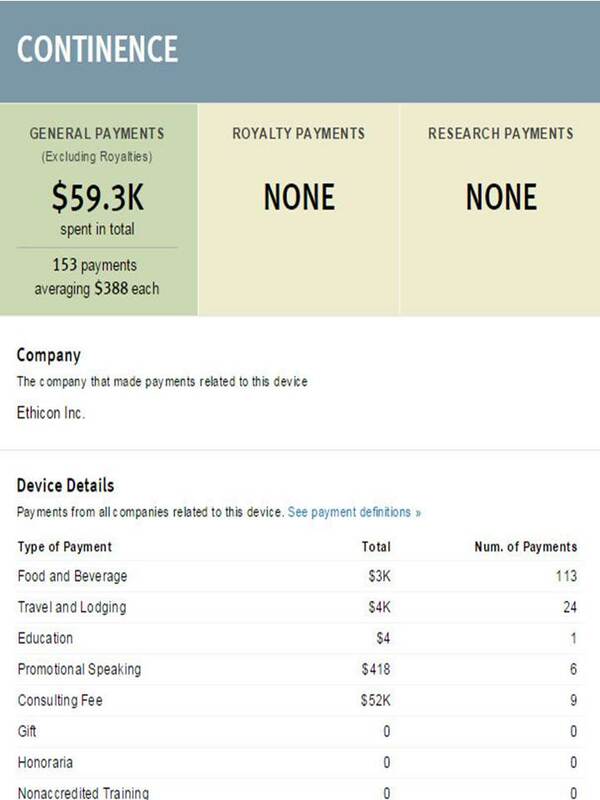 Budgets are likely different between the two companies as well-meaning the majority of the payments are likely from Johnson & Johnson’s Ethicon. Clear as mud, right? Again, this by design from both the U.S. Government and the Device makers, to lead the patients and taxpayers in a maddening loop of confusion to distract from the real issues. Think about it-if they can afford to pay billions in fines still spend this kind of money on “education” and the DOJ doesn’t have to tell the taxpayers where all these billions go-what’s the incentive for either side to want to fix this broken system? 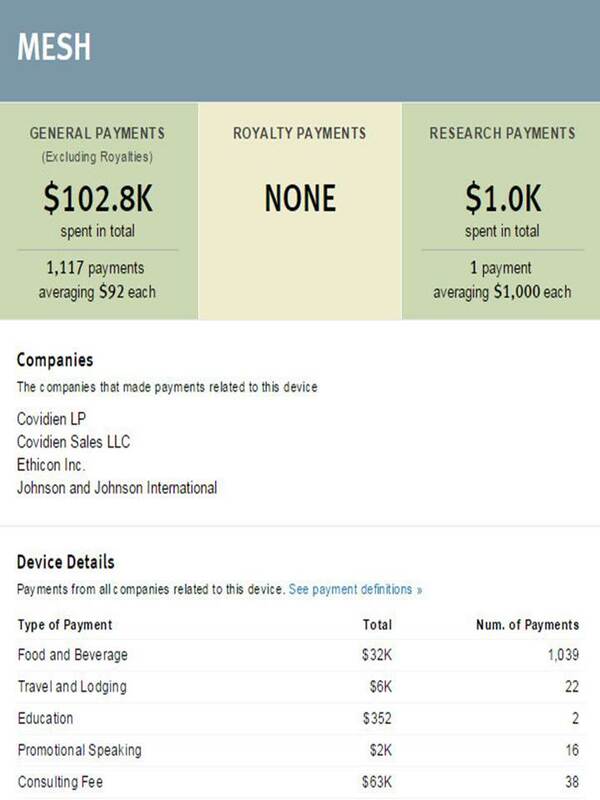 CMS Infographic 2014Ethicon OneEthicon's name changeFlaws within the Open Payments CMS Sunshine Act systemJohnson & JohnsonJohnson & Johnson Injured PatientsJohnson & Johnson putting a Band-Aid on problemsJohnson & Johnson's DePuy Synthes ASR HipsJohnson & Johnson's DePuy Synthes paid doctors more than $51 million in the last five months of 2013Johnson & Johnson's DePuy Synthes Pinnacle HipsJohnson & Johnson's device division (Ethicon/DePuy Synthes) paid more than $56 million to doctors in the last five months 2013Johnson & Johnson's Ethicon paid doctors over $5 million in the last five months of 2013Johnson & Johnson's Ethicon's Gynecare Transvaginal MeshMedical device Hips spent $9.4 Million of physicians in five months 2013Open Payments & Sunshine Act are the same thingProPublica Open Payments DataTips for making the CMS website betterWhat is Johnson & Johnson's Ethicon doing with Acclarent?